هدف اصلی این پژوهش تعیین شاخص آمادگی زیرساخت اطلاعات مکانی ملی (NSDI) ایران و شناسائی عوامل محدودکننده در ایجاد این زیرساخت می‌باشد. چارچوب اصلی پژوهش بر اساس پیمایش و مدل آمادگی زیرساخت اطلاعات مکانی (Readiness ModelSDI) بنا شده است. در این تحقیق، NSDI ایران بر اساس این مدل فازی پایه، با استفاده از 16 معیار تصمیم‌گیری در قالب پنچ عامل سازمانی، منابع انسانی، داده و اطلاعات، فناوری و مالی مورد ارزیابی قرار گرفته است. داده‌های مورد نیاز پژوهش با کمک پرسشنامه و مصاحبه با کارشناسان آشنا با زیرساخت اطلاعات مکانی از سازمان‌های دولتی، دانشگاه‌ها و بخش خصوصی کشور تهیه گردید. بعد از جمع‌آوری داده و اطلاعات، مقادیر شاخص‌های کلی و عامل‌های پنجگانه بر اساس مدل آمادگی محاسبه شدند. براساس نتایج، وضعیت شاخص آمادگی کلی NSDI کشور در سطح پایین ارزیابی شده و برابر 44/0 محاسبه گردید. همچنین نتایج ارزیابی عامل‌ها نشان داد که تمامی آنها به استثنای عامل فناوری، کمتر توسعه یافته‌اند. بعلاوه، وضعیت 75 درصداز معیارهای تصمیم‌گیری نیزرضایت بخش نمی‌باشد. در این تحقیق، وضعیت سرمایه‌گذاری دولت و بخش خصوصی، زیرساخت‌های ارتباطاتی، رهبری سازمانی و فردی، مسائل قانونی، دیدگاه سیاستمداران، متادیتا، فرهنگ و آموزش در رابطه با زیرساخت اطلاعات مکانی از اهم معیارهای محدودکننده در استقرار NSDI شناخته شدند. علیرغم عوامل متعدد بازدارنده توسعه NSDI، وضعیت معیارهای اتصال به وب، دسترسی به داده و اطلاعات مکانی رقومی، سرمایه انسانی و دسترسی به نرم‌افزارهای مکانی در سطح مطلوبی از توسعه ارزیابی شدند. همچنین بر اساس نتایج این تحقیق، چنین به نظر می‌رسد که در توسعهNSDI کشور، مسائل غیرفنی (عوامل سازمانی، منابع انسانی و مالی) بیشتر از مسائل فنی (عامل فناوری) می‌توانند به عنوان عامل محدودکننده نقش ایفا نمایند. در پایان پیشنهاداتی در راستای رفع محدودیت‌های توسعهNSDIکشور ارائه شده است. The main objective of this research was to determine Iran’s National Spatial Data Infrastructures (NSDI) readiness index, with the aim of identifying the basic restrictions that impede NSDI development. The framework of the research is constructed on the basis of survey and SDI readiness model. In this research, Iran’s NSDI based on this fuzzy-based model has been assessed using 16 decision-making criteria in the form of five organisational, human resources, data and information, technological and financial factors.The required data for the research were collected through the questionnaire and interview with the experienced experts from the government agencies, Universities, and private sector of the country who were familiar with the spatial data infrastructure. The results of the implementation of the model demonstrated that Iran’s NSDI readiness composite index was 0.44. In addition, the assessment of the factors of Iran’s NSDI readiness showed that all of them, with the exception of the technology factor, were less developed. Moreover, the status of 75% of decision-making criteria was not satisfactory. In this research, the state of investment of the government and the private sector, communication infrastructure, organizational and individual leadership, legal issues, politicians' perspective, metadata, culture and education regarding the spatial data infrastructure were recognized as the most important limiting measures in the establishment of the NSDI. In spite of numerous factors inhibiting the development of NSDI, the status of criteria for connecting to the Web, access to data and digital spatial data, human capital, and access to geospatial software were evaluated at an appropriate level of development. Also, according to the results of this research, it seems that in the development of the NSDI, non-technical issues (organizational, human resources, and financial factors) can play a role as a limiting factor than technical issues (technological factor). At the end of the paper, recommendations have been presented to resolve the country’s NSDI development constraints. 1- شهیدی نژاد، آل شیخ، کلانتری اسکویی؛ محمدجواد، علی‌اصغر و علی(1394)، ارزیابی زیرساخت داده‌های مکانی ملی با استفاده از مدل BSC، نشریه علمی- پژوهشی علوم و فنون نقشه‌برداری، دوره پنجم، شماره 3، تهران. 2- Boc, K., Vaculík, J., andVidriková, D., (2012). Fuzzy approach to risk analysis and its advantages against the qualitative approach. Proceedings of the 12th International Conference Reliability and Statistics in Transportation and Communication (RelStat’12), 17–20 October, Riga, Latvia, pp 234–239. 3- Crompvoets, J., Rajabifard, A., Loenen, B., and Delgado Fernández, T., (2008). A Multi-View Framework to Assess SDIs. Published jointly by Space for Geo-Information (RGI), Wageningen University and Centre for SDIs and Land Administration, Department of Geomatics, The University of Melbourne. 4- Crompvoets, J., Rajabifard, A. and Williamson, I., (2004). Assessing the worldwide developments of national spatial data clearinghouses. International journal ofgeographical information science, Vol 18, pp 665- 689. 5- De Man, W.H.E., (2011). Spatial Data Infrastructuring: Praxis between Dilemmas. International Journal of Spatial Data Infrastructures Research ( IJSDIR), Vol6, pp 261-289. 6- Delgado, T. and Crompvoets, J., (2008). Evaluating Spatial Data Infrastructures in the Caribbean for Sustainable Development. Proceedings of GSDI-10 Conference, Small Island Perspectives on Global Challenges. 7- Delgado, T., and et al., (2008). The Spatial Data Infrastructure Readiness model and its worldwide application. In: Crompvoets, J., Rajabifard, A., Loenen, B., and Delgado Fernández, T. (eds. ): A Multi-View Framework to Assess SDIs, pp 132-149. 8- Delgado, T., et al., (2005). Assessing an SDI Readiness Index, From Pharaohs to Geoinformatics. FIG Working Week 2005 and GSDI-8 Cairo, Egypt. 9- Department of Economic and Social Affairs, (2014). United Nations E-Government Surveys, E-Government for the Future We Want. United Nations publication, New York. 10- Farahi, A., Jahedi, A., (2010). 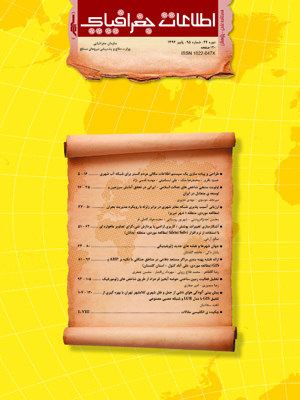 Iran's NSDI obstacles from information technology point of view. The University of Payannor, Tehran. 11- Giff, G. and Jackson, J., (2013). Towards an Online Self Assessment Methodology for SDIs. GSDI 14 Conferences. 12- Grus, L., (2010). Assessing Spatial Data Infrastructures. NCG, NederlandseCommissievoorGeodesie, Netherlands Geodetic Commission, Delft, the Netherlands. 13- Mansourian, A. andValadanZoej, M. J. (2008). Iran SDI Initiative: Study Phase of NSDI. The International Archives of the Photogrammetry, Remote Sensing and Spatial Information Sciences XXXVII, B4, Beijing. 14- McDougall, K., (2006). A Local-State Government Spatial Data Sharing Partnership Model to Facilitate SDI Development. Doctor of Philosophy, The University of Melbourne, Australia. 15- Mohammadi, H., (2008). The Integration of Multi-source Spatial Datasets in the Context of SDI Initiatives. Doctor of Philosophy, The University of Melbourne, Australia. 16- Okuku, J., Bregt. A.,andGrus. L., (2014). Assessing the Development of Kenya National Spatial Data Infrastructure (KNSDI). South African Journal of Geomatics Vol 3, No. 1. 17- Pinsonnault, R., (2013) Toward a User-Centric Peru Spatial Data Infrastructure Based on Free and Open Source Software. M.Sc. thesis, VrijeUniversiteit Amsterdam The Netherlands. 18- Rajabifard, A., Feeney, M.E.F., Williamson, I. and Masser, L., (2003). National SDI Initiatives. In: Williamson I. P., Rajabifard, A. and Feeney M. E. (Eds.). Developing SDIs: From concept to Reality, London, UK: Taylor and Francis. pp 95-109. 19- Vaezi, H., Baktash, P. andJavidaneh, A., (2012). SDI Situation in Islamic Republic of Iran's. Proceedings of Global Geospatial Conference Québec City, Canada.